Investing in global real estate ETFs can provide steady stream of income for investors. Global real estate investment can be advantageous for investors that seek capital appreciation & global diversification. Global real estate funds utilize their assets to purchase mainly non-US real estate securities, but may also invest in U.S. real estate securities. Depending on the objective, these investment funds may invest in: debt & equity securities, convertible securities, and securities issued by Real Estate Investment Trusts (REITs) and REIT like entities. Global real estate funds invest mainly in developed countries real estate such as United Kingdom, Germany, Spain, Hong Kong, Singapore, South Korea, Brazil, etc. Some of the funds may provide high yield income for investors. If you are interested in these global real estate funds, you can choose low cost exchange traded funds (ETFs). ETFs can provide instant diversification and lower risk than investing in individual stocks. 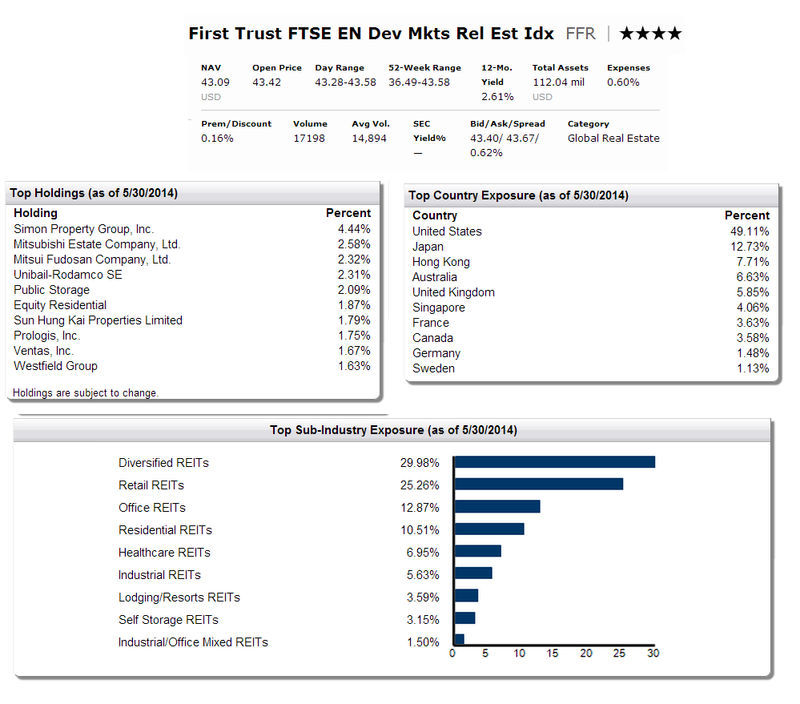 One of the ways to invest in global real estate ETFs is by looking at the top performing ETFs for the past 1 year. These top ETFs are selected based on its 1 year return. You can find other fund information such as expense ratio fee, portfolio turnover rate, management or index approach, performance, etc. You can find the fund review and comparison below. 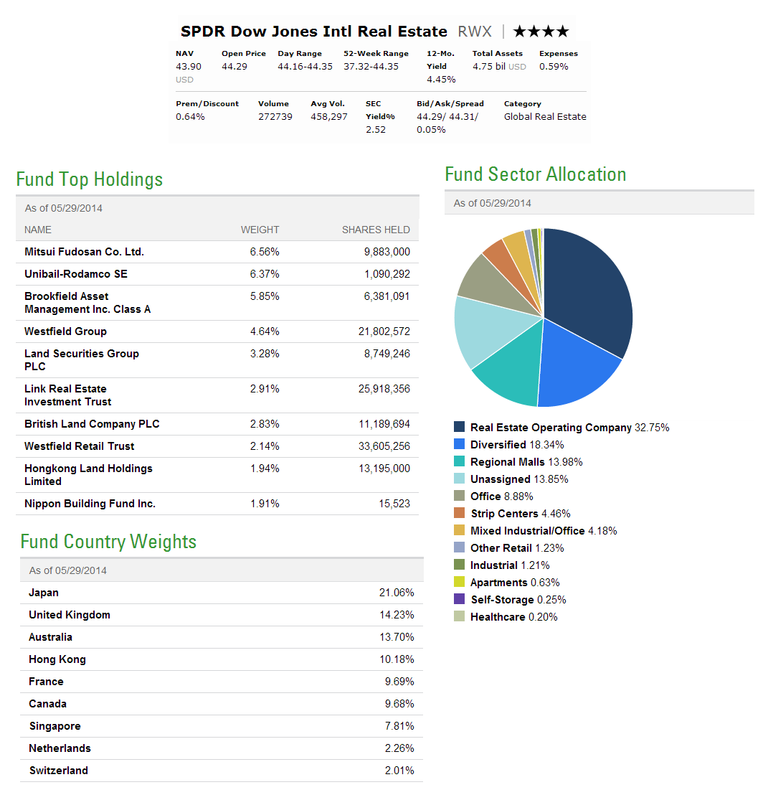 This SPDR Dow Jones International Real Estate ETF has $4.75 billion total assets. The investment objective is to provide investment results, correspond generally to the total return performance of the Dow Jones Global ex-U.S. Select Real Estate Securities Index. The fund is currently traded at premium 0.41% from its NAV. The CUSIP is 78463X863. The fund has 3.58% dividend yield that is distributed quarterly. Morningstar analysts rank 4-stars rating for this RWX Fund. As one of the top global real estate ETFs, it also has 5-year annualized return of 15.33% and 1-year annualized return of 12.73%. The YTD return is 7.85%. Since the inception in 2006, the best 1-year return in 2012 with 39.12% and the worst in 2008 with -50.63%. The top 3 stocks in its holdings as of May 2014 are Mitsui Fudosan Co. Ltd (6.56%), Unibail-Rodamco SE (6.37%) and Brookfield Asset Management Inc Class A (5.85%). Japan (21.06%) is the top country weight. The iShares International Developed Property ETF seeks to track the investment results of an index composed of real estate equities in developed non-U.S markets. It was incepted in July 2007. The total assets are $182.87 million. Its annual expense ratio is 0.48%. The fund is currently traded at premium 0.04% from its NAV. The fund has a total of 334 total holdings. The top 3 holdings are Mitsubishi Estate Co. Ltd (4.73%), Mitsui Fudosan Co. Ltd (4.08%) and Unibail-Rodamco SE (3.80%). This First Trust FTSE EPRA/NAREIT Developed Markets Real Estate Index Fund has 4-stars rating from Morningstar for the performance. The total net assets are $112.04 million. The annual expense ratio is 0.60%. The 12-month yield is 2.61%. Last year, 2013, the FFR fund returned in 2.47%. In 2014, the year-to-date return is 10.61%. 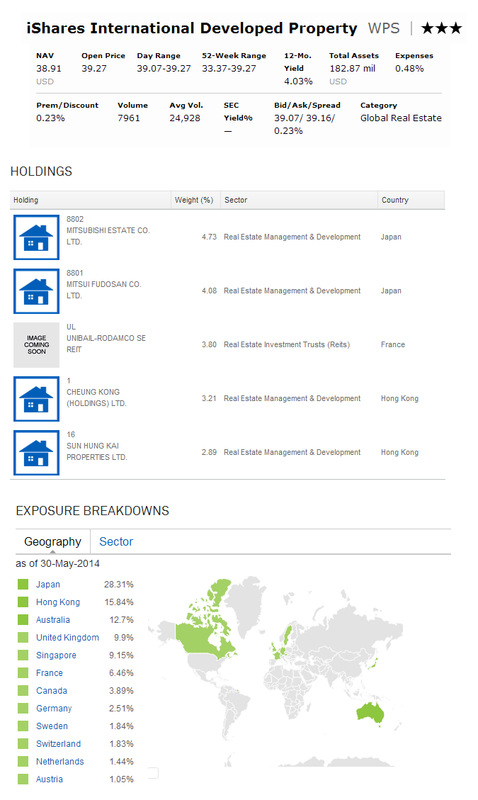 As of May 2014, the top 5 equity holdings are Simon Property Group, Inc (4.44%), Mitsubishi Estate Company, Ltd (2.58%), Mitsui Fudosan Company, Ltd (2.32%) and Unibail-Rodamco SE (2.31%). United States (49.11%) is the top country exposure.